Finished number 3 for this year. 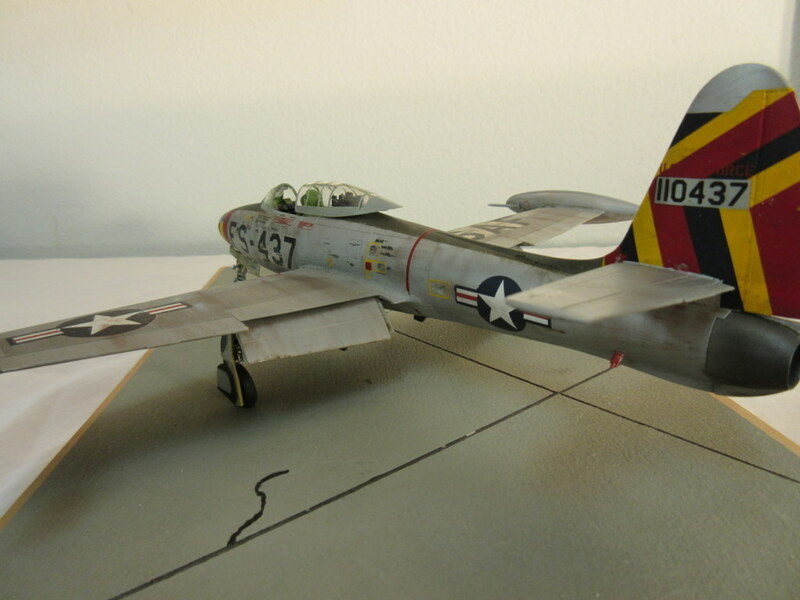 I am now ahead of last years total production by 50% and have added another 50s jet to the shelves. 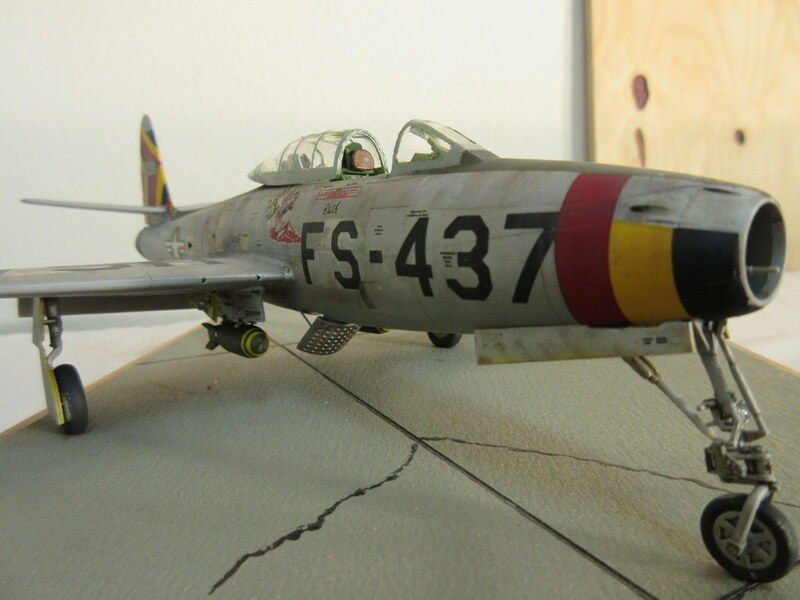 After spending a few years building Monogram 1/48 Century Jets his was a great kit. It went together perfectly. 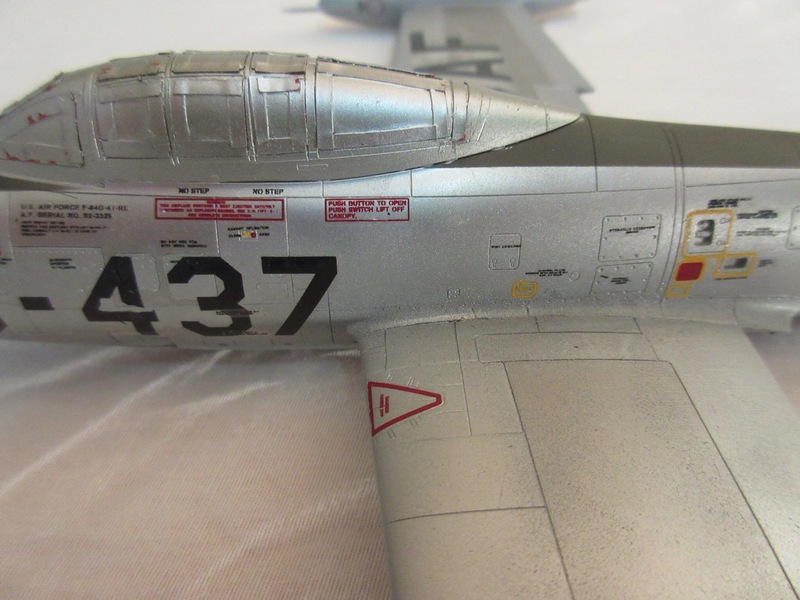 Well engineered, fit was spot on, detail pretty reasonable. 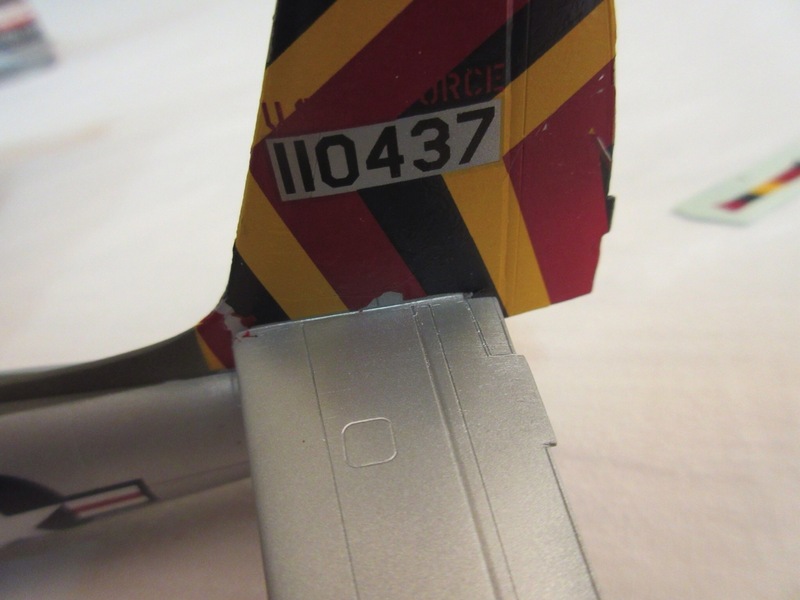 The only problem I had was the decals cracked, not because they were old, but because they just wouldn’t come loose from the backing sheet. 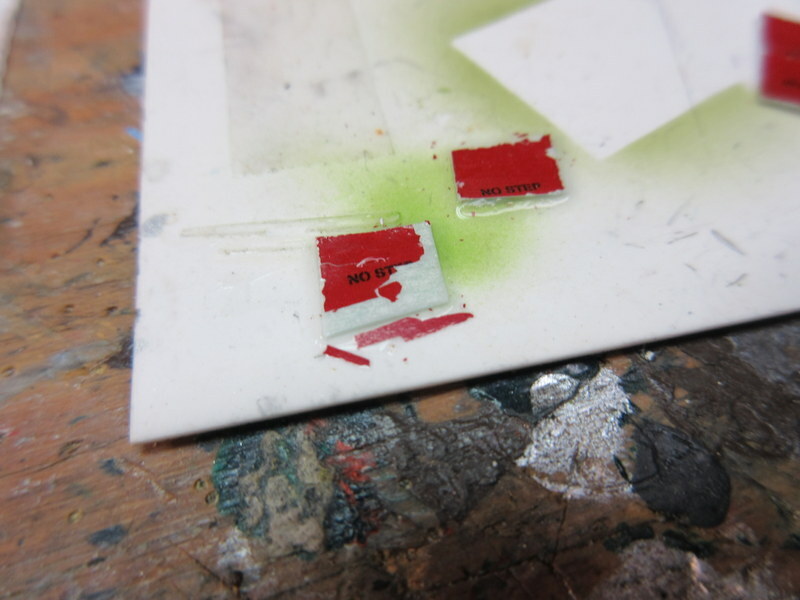 But once I learned to soak the bejeezus out of them… well 50+ stencils later. 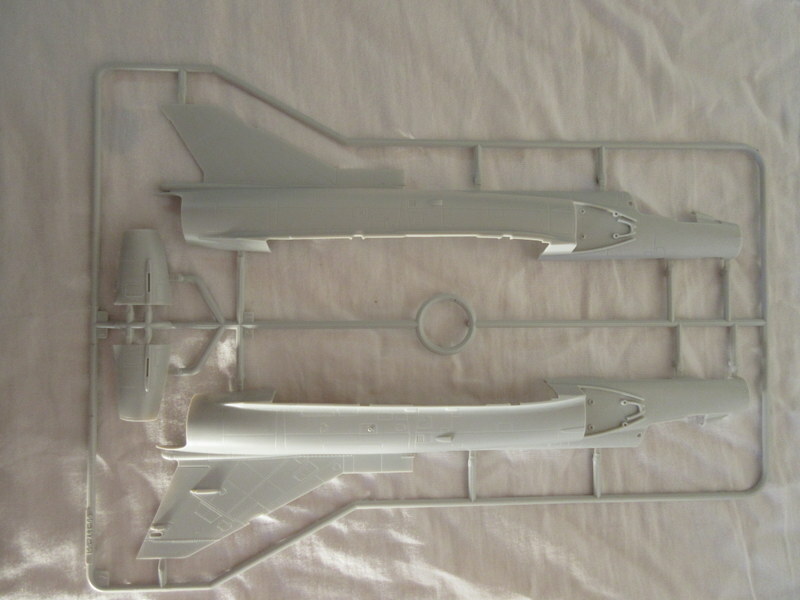 I’d recommend this kit if your into 50s jets. Grubbed this one up a bit, even though it has a metal finish I’m sure working birds in Korea weren’t very shinny. 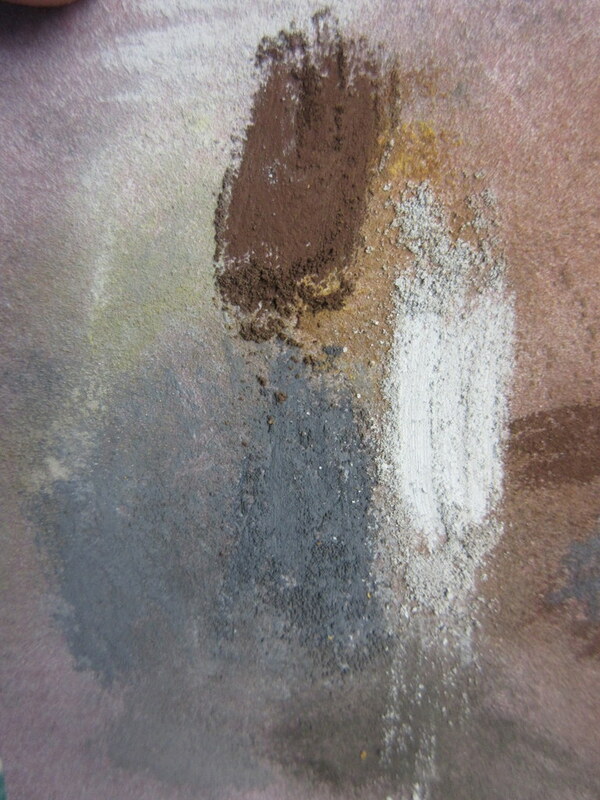 Started with the oil wash described in a previous post and finished up with pastels. I’m finding I like using them more each kit I build. Then a coat of Testors Dullcoat. 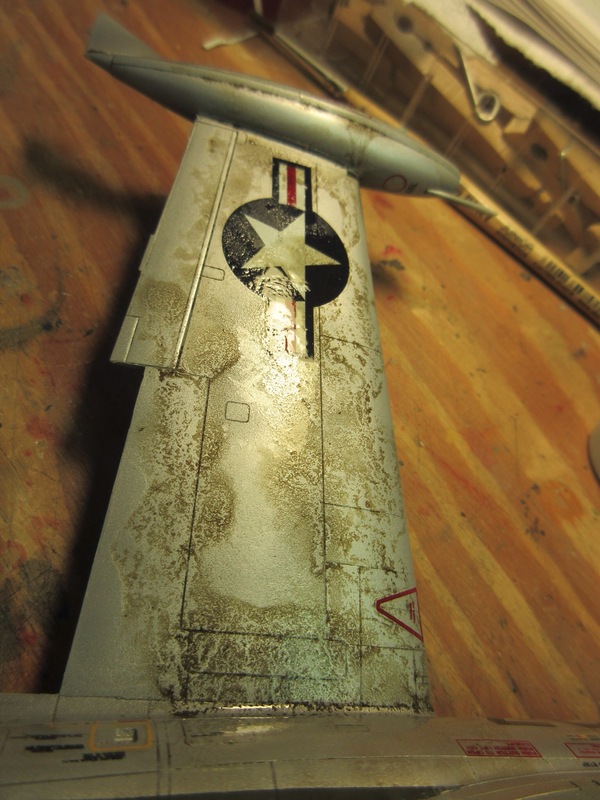 A well worn workhorse. 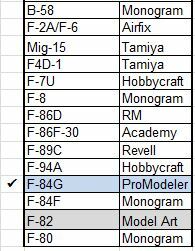 Check-off the first of my 50s aircraft plan. 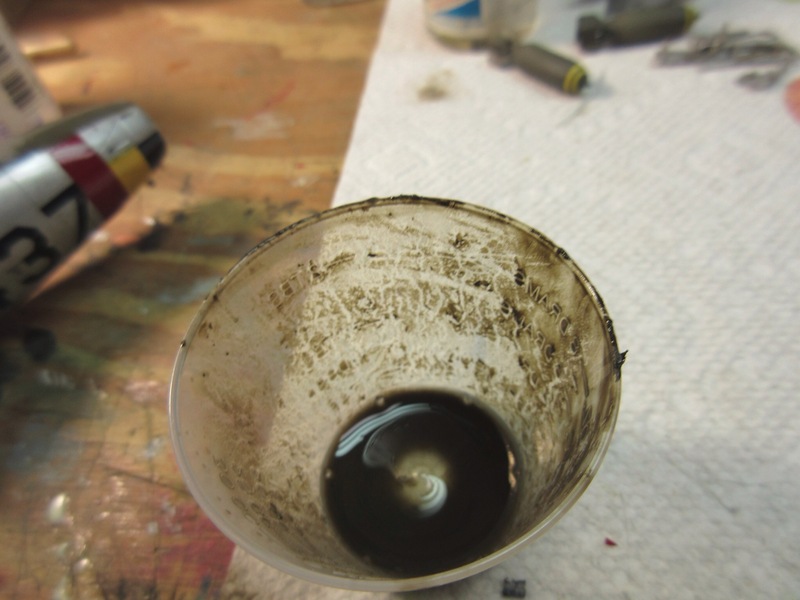 I use a raw umber oil color for what’s fondly called a “sludge wash”. 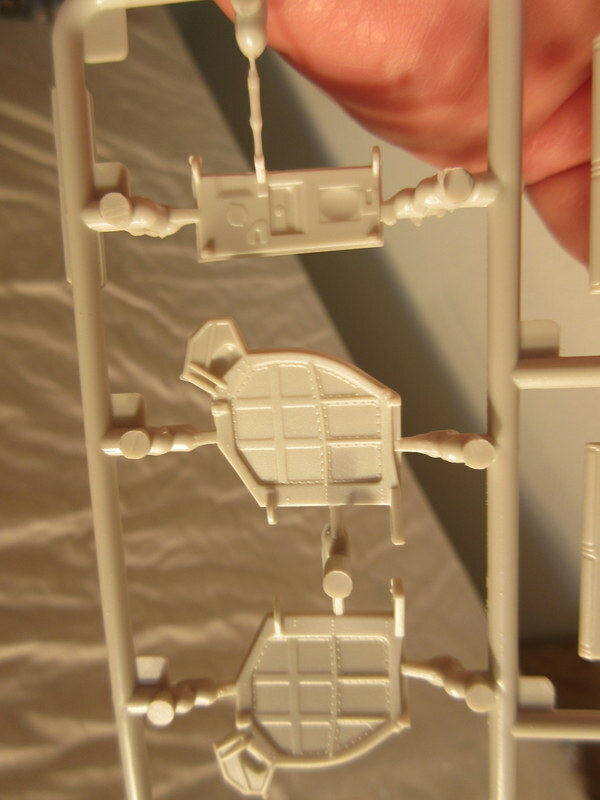 Idea here is to get some color into the panel lines and to break up the monotone of a single color (it will leave residual color). 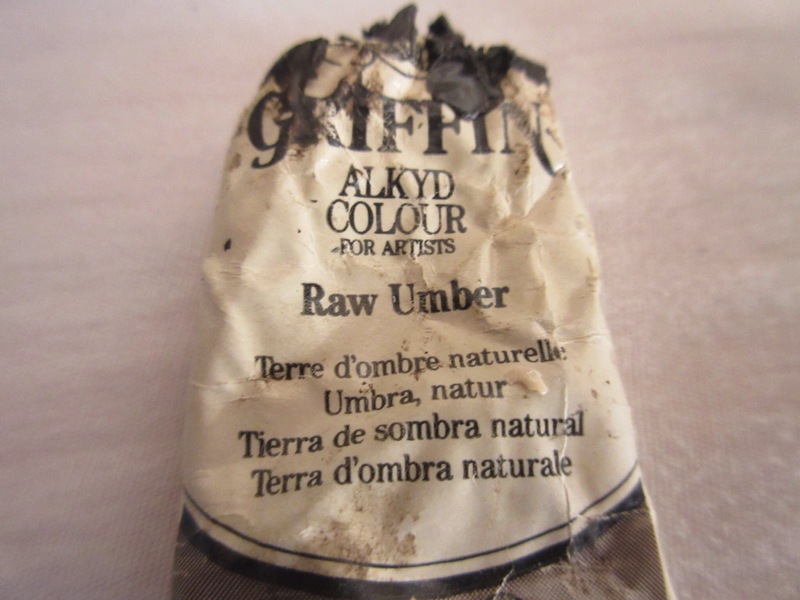 Mix it with turpentine and you have liquid grubby. 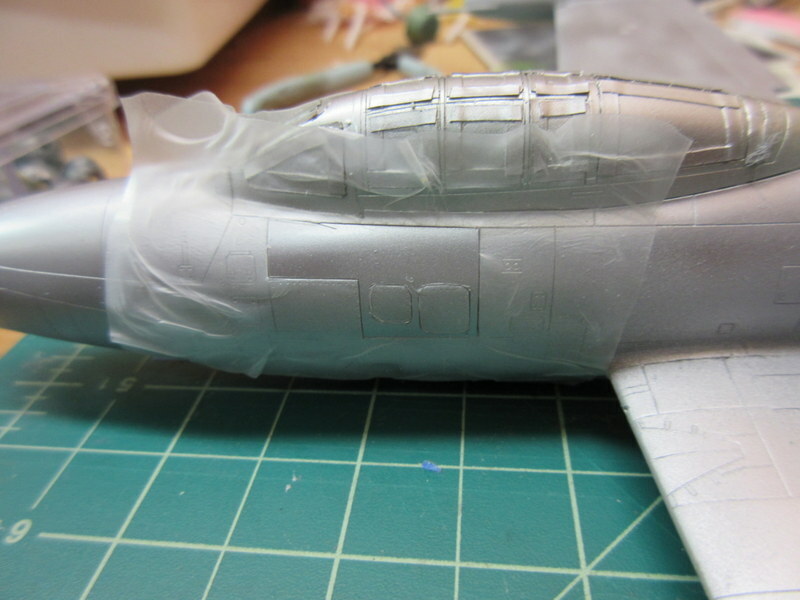 I now liberally cover the model with this color, and after it sets a bit, take a clean paper towel and wipe it off in the direction of the airflow. 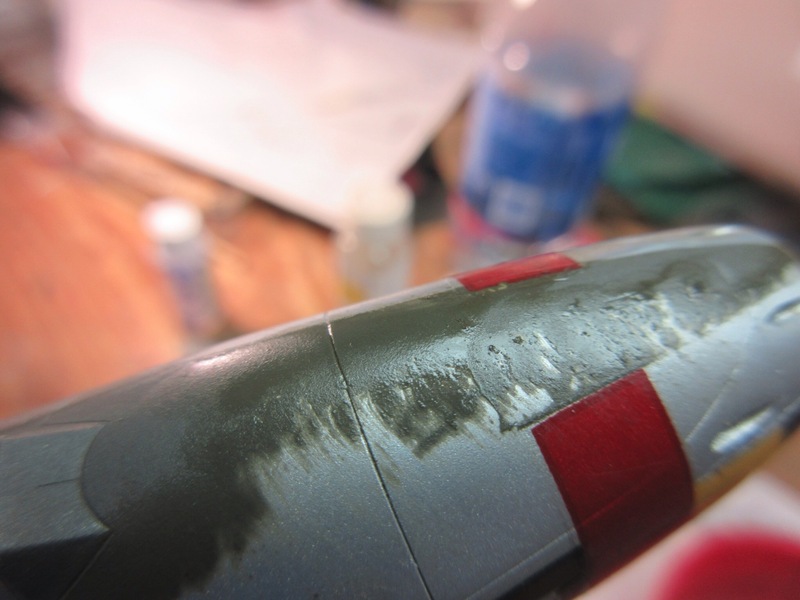 I usually apply a coat of future before I do this to protect the paint, but the Alclad is tough and can take it. 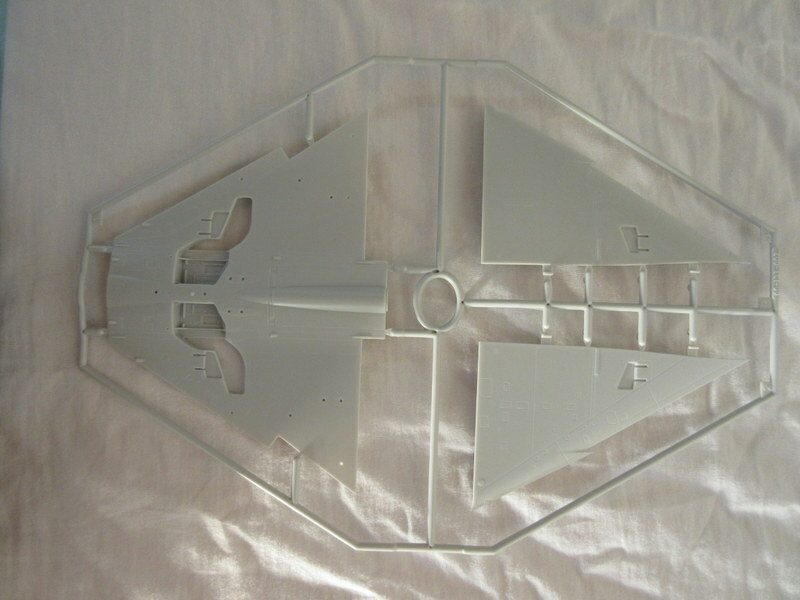 But I forgot that the Model a Master wasn’t and I rubbed off some of the anti-glare panel, and had to re-airbrush it. 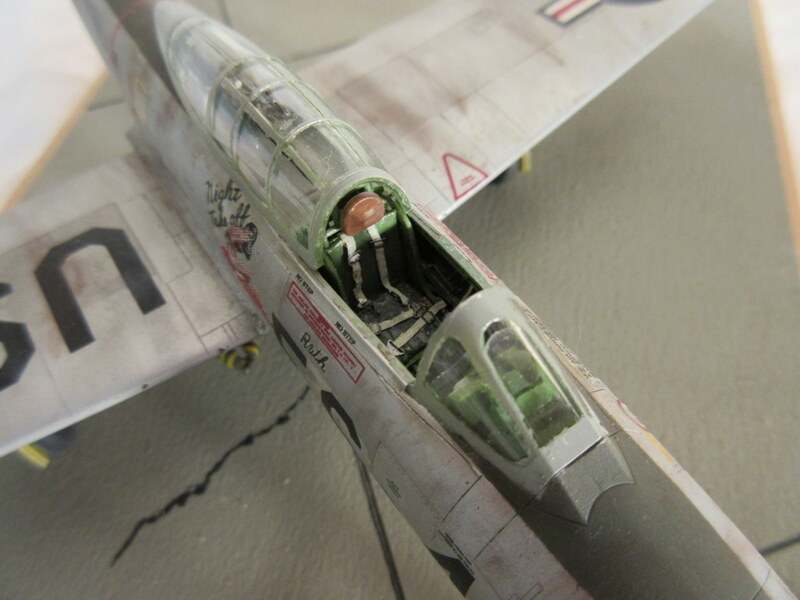 After a near perfect build decaling the jet has been a hold your breath adventure. The engineering and fit of the ProModeler kit has been some of the best I’ve seen, too bad the decals have behaved poorly. 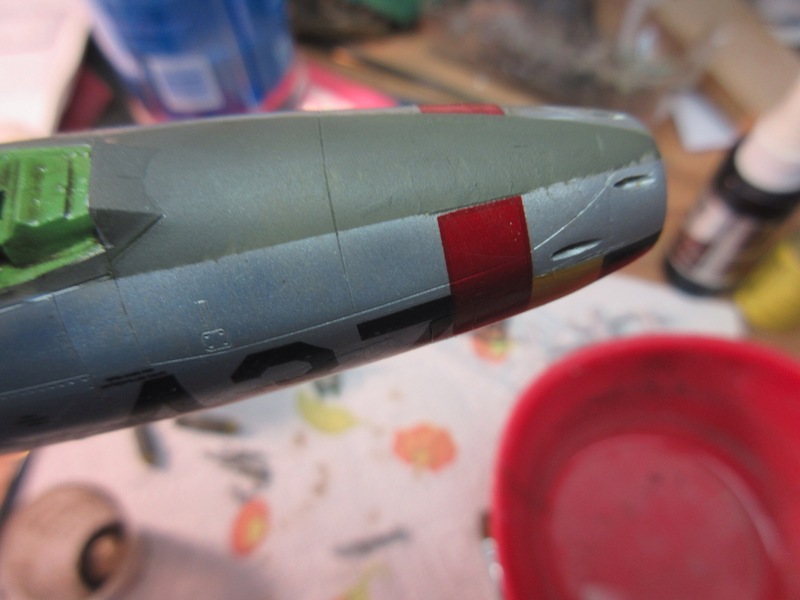 Almost all of the decals have cracked and gone on the kit in multiple pieces. 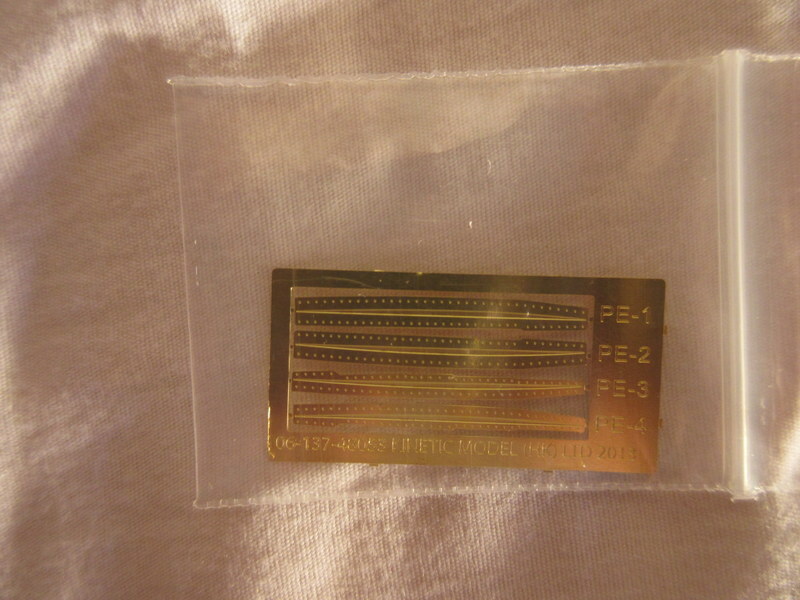 They just won’t unstick from the backing, requiring some coercion to get the to move, which causes breakage. I have had a bit more success as I got used to them and had to soak the heck out of them to get them to come loose. I’ll more than likely have to do touch up (the joy of color matching) with paint but overall the kit is looking pretty good. 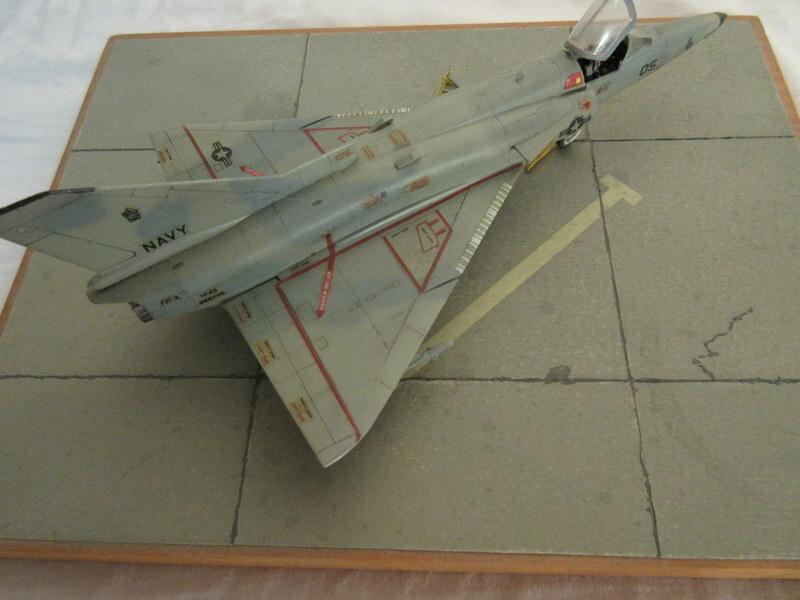 The reason I picked this kit over the Tamiya one is the particular decal scheme, “Night Takeoff”. 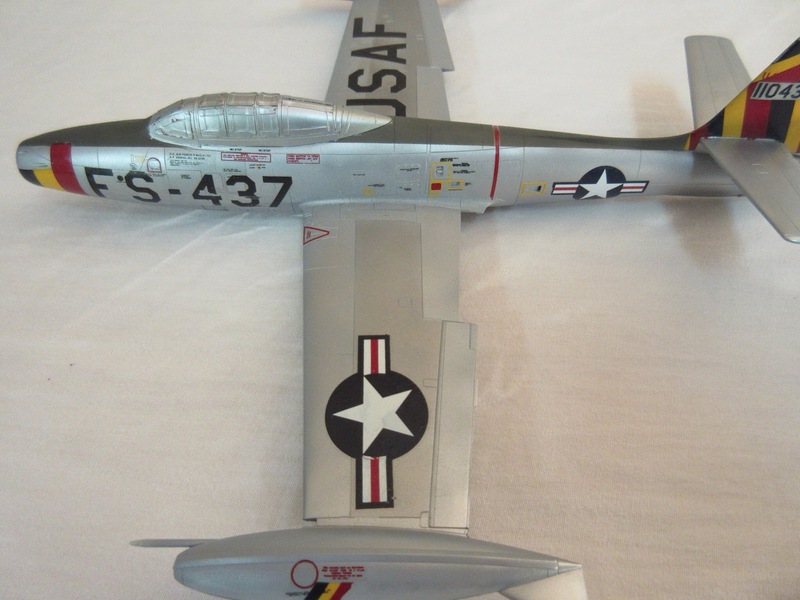 I just finished a P-61 a few kits back with the same name. Next time I’ll get aftermarket decals. 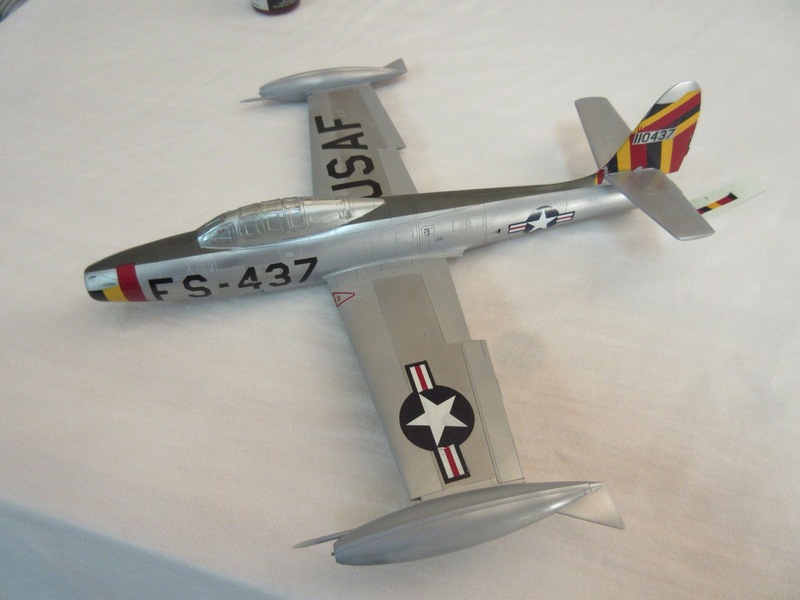 There were lots of nice ones for a F-84. 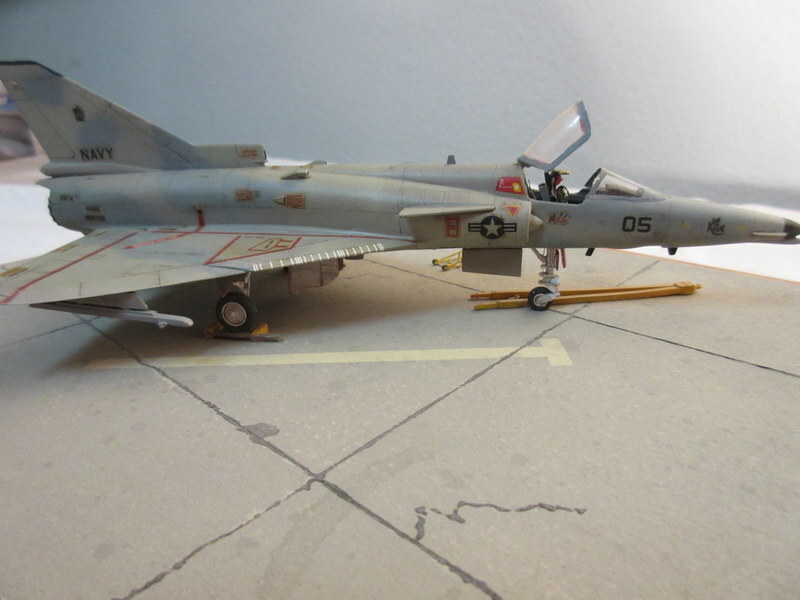 Next up after I get done with my F-84 is the Kinetic F-21 kfir. 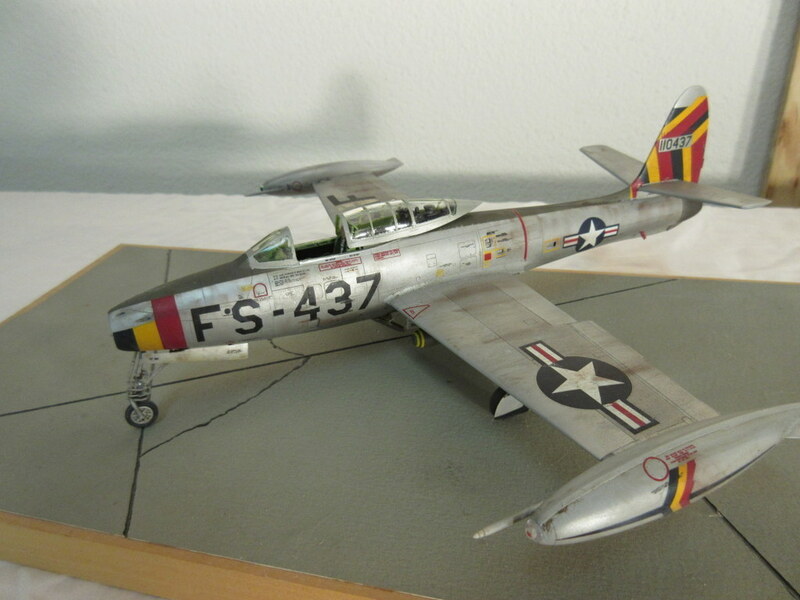 I’ve always wanted to make a 1/48 scale version of this since I built the 1/72 Testors kit about 25 year ago. 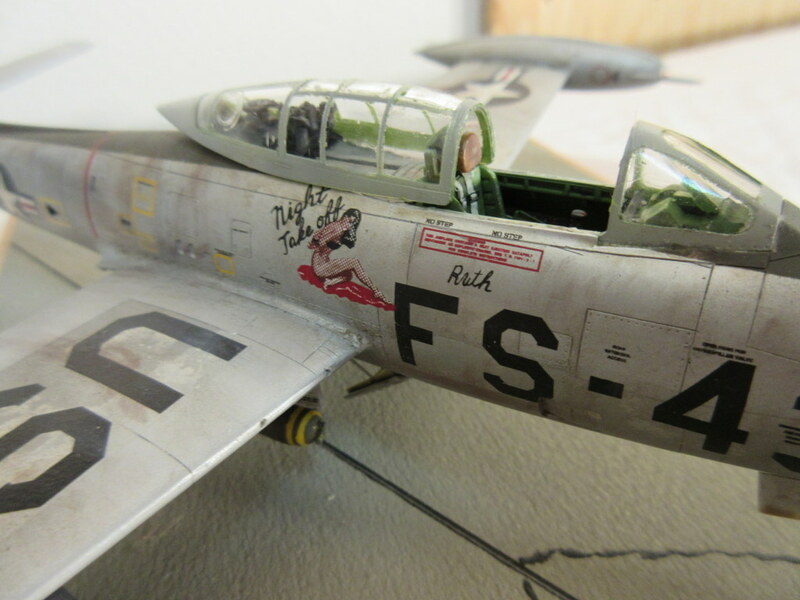 I was just getting back into the hobby and I was working out of my furnace room on a workbench I still use. 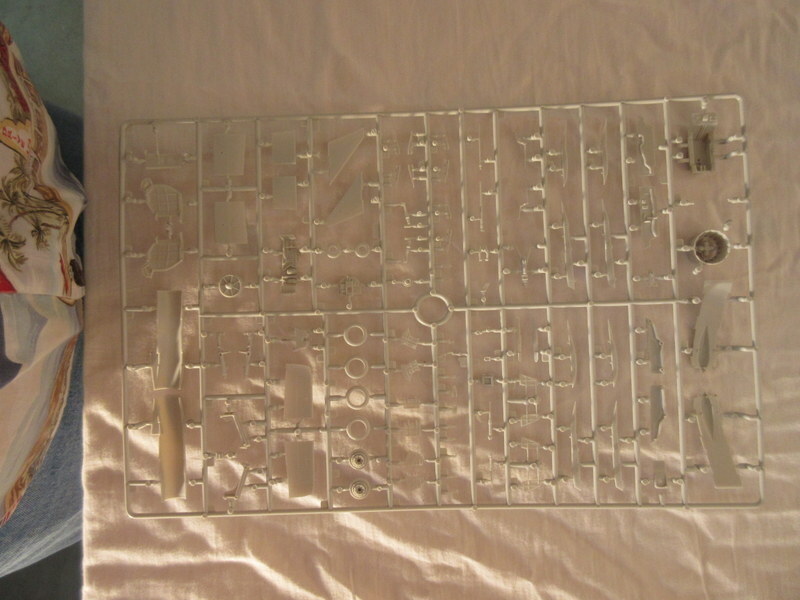 The lovely bride gave me the kit for Christmas and I am almost doing the unthinkable; building a kit I got for Christmas within a couple of month of Christmas. 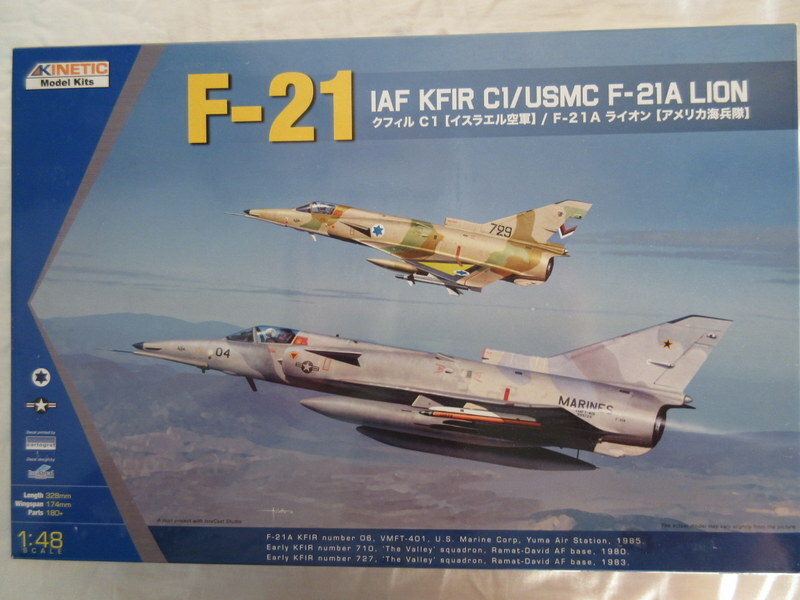 Back in the day (I can say that now) when we used to get kits for Christmas we weren’t real modelers unless they were built before Christmas vacation was over, and usually, unless it was a large kit, by the end of Christmas day. The kit will has a cool wrap around camo. And it’s a Marine jet besides. 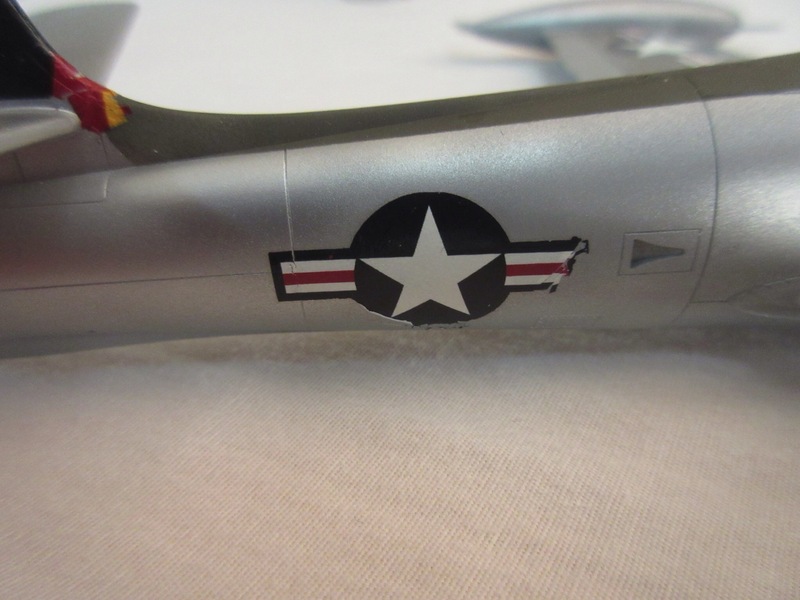 You can get an aftermarket set from Furball decals but I like the 3 gray camo in the kit. 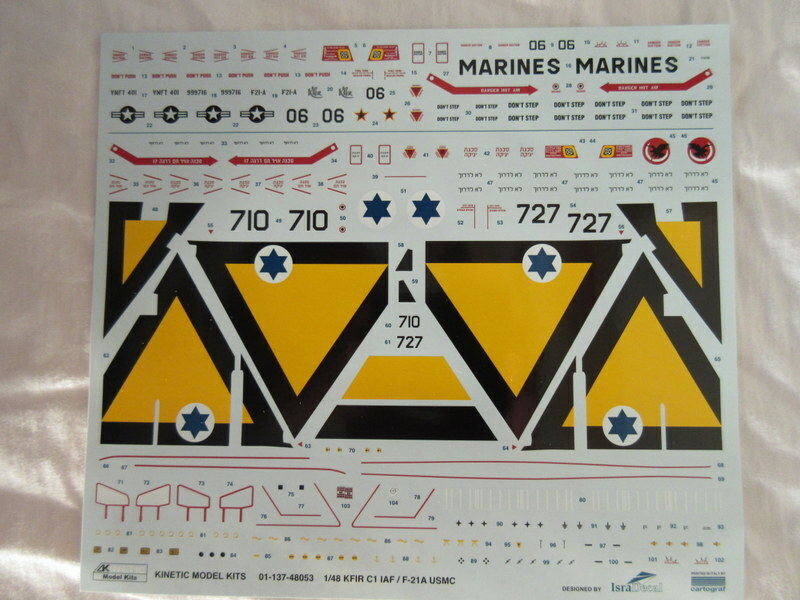 Decals show that you can build the Israeli version of the kit as well, the Marine decals are actually very small and short in number. 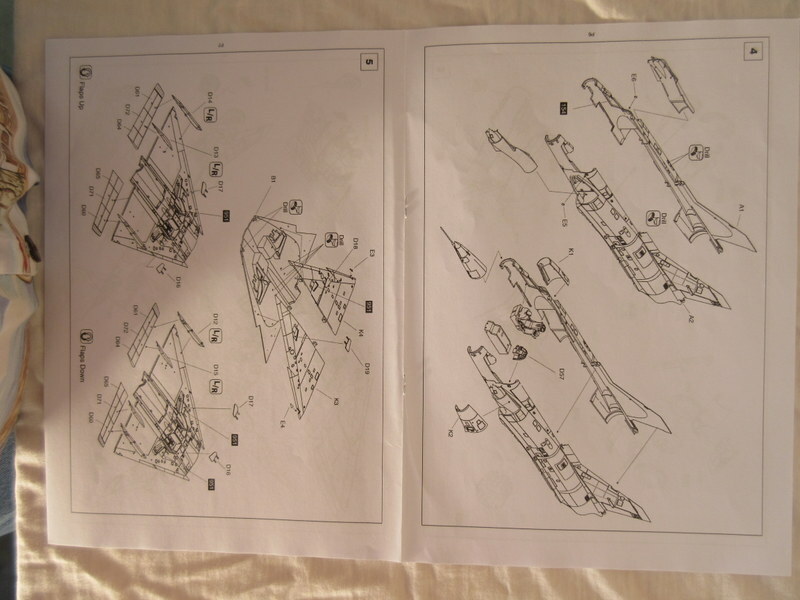 The instructions are going to be a challenge to make sure I don’t miss something. 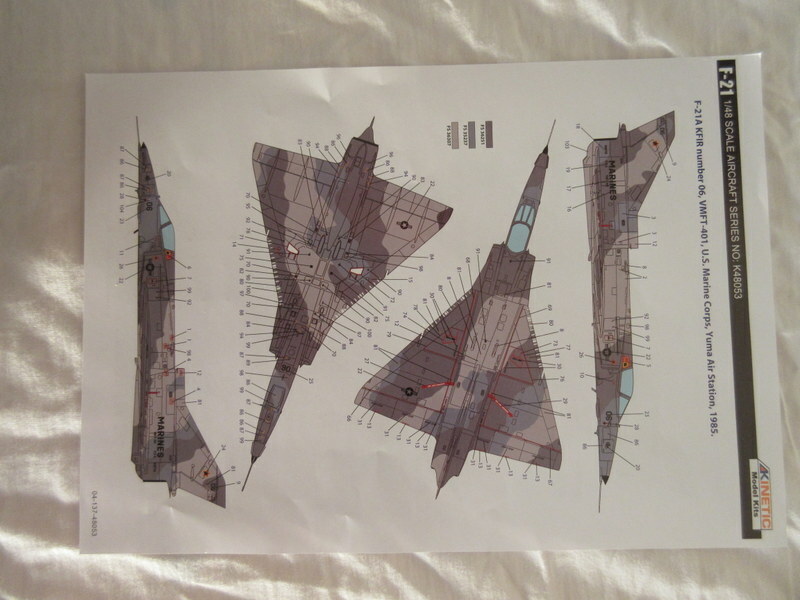 They are just images and part numbers and are going ot take some study. 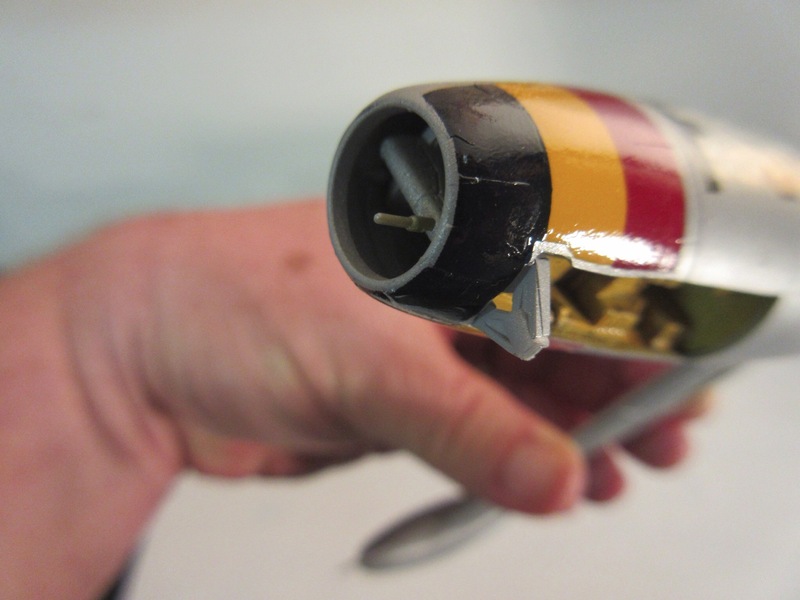 Kit comes with two different types of upper wing, but only one is used. 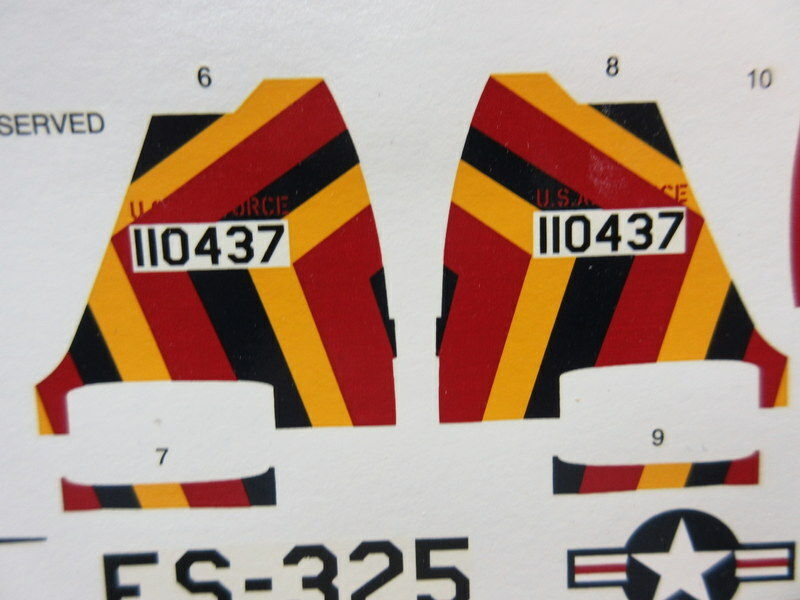 There are a lot of nose options in the kits as well that aren’t used, so I suspect other version can be made. Detail is okay but looks a little soft. Not as crisp as the other kits I have been building, but with some good painting and highlighting I think it will be great! 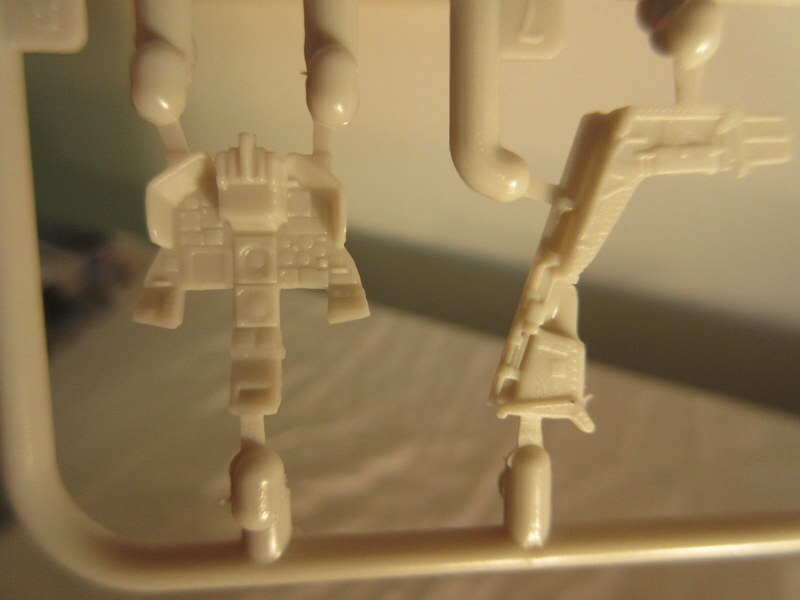 There are two ejection sets in the kit and two instrument panels, leading me to believe other version can be made. 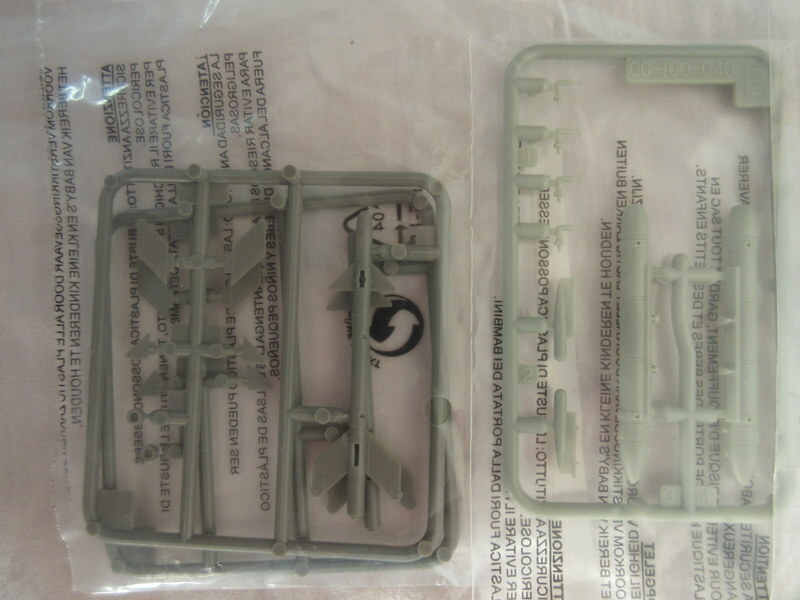 The kit comes with some photo etch for what looks like canard bracing and two sets of ordnance, neither of which will be used on the aggressor aircraft. 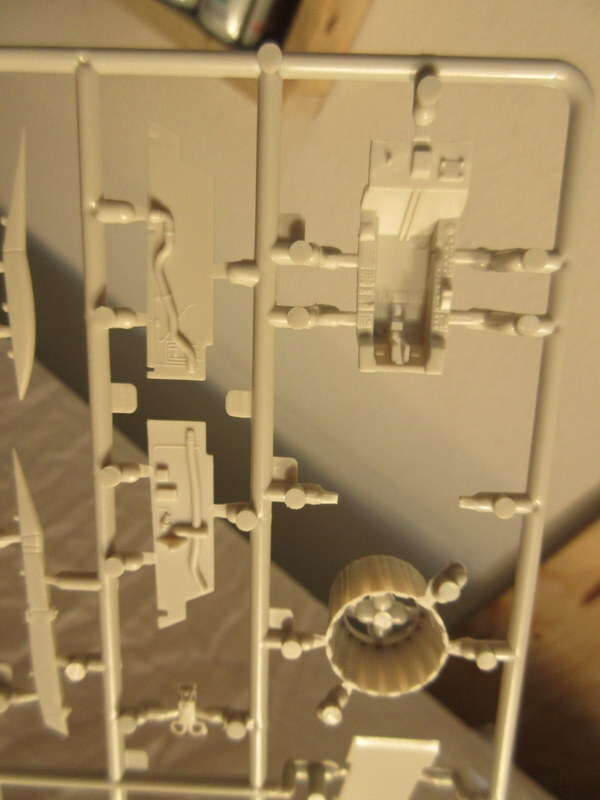 The pod on the right in the photo shown as sprue “E” is no where to be seen in the instructions (and the clear sprue is also sprue “E”). Looks like I’m going to have to scrounge or make an ACMI pod. 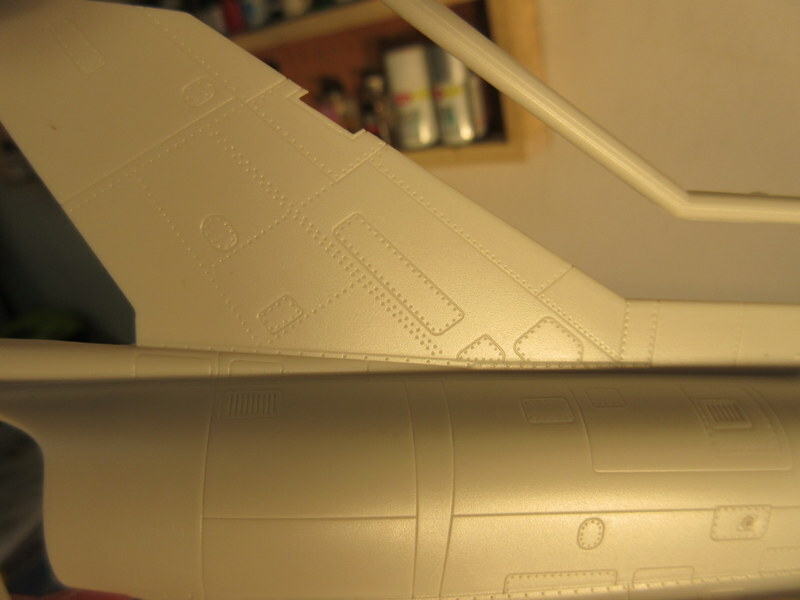 Fuselage panel lines are a little soft as well but very detailed. Should be a fun kit with the 3 gray wrap camo. Looking forward to getting underway. 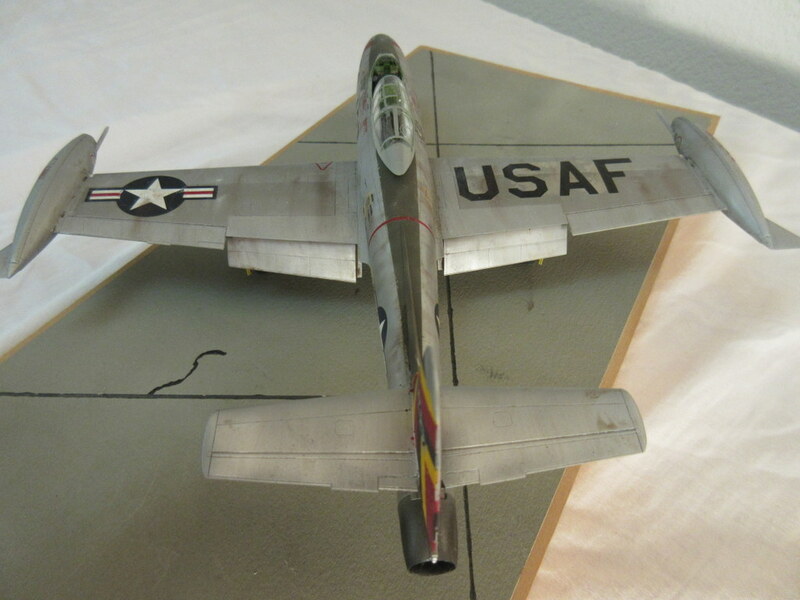 Started decaling the F-84 today. The first decals were a bust. 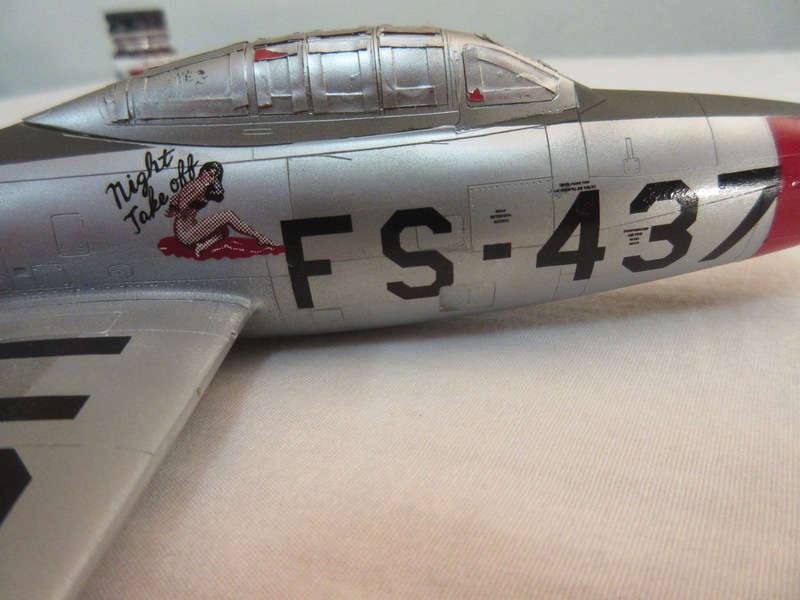 I usually try a couple of not really needed decals first to see what I’m up against and I was about ready to throw in the towel. 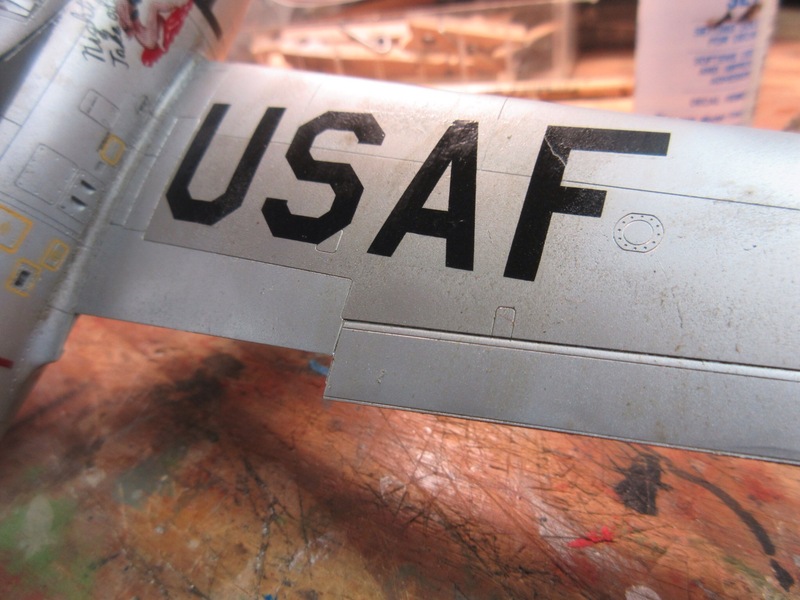 But being the optimist I am and knowing things could only get better I decided to go all out and try the main markings for under the wing, and they worked! The stars and bars split a bit putting them on but I found that I needed to apply micro set liberally to keep them moving along. They also seem to need to be soaked for longer than I am used to. 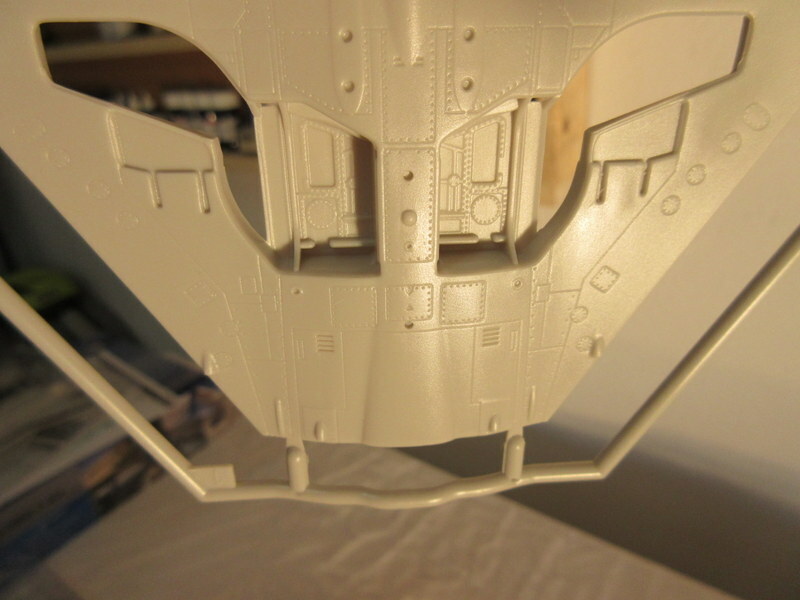 The USAF in it’s split up configuration for the landing gear door went on better than I anticipated, and the fit around the doors was perfect. 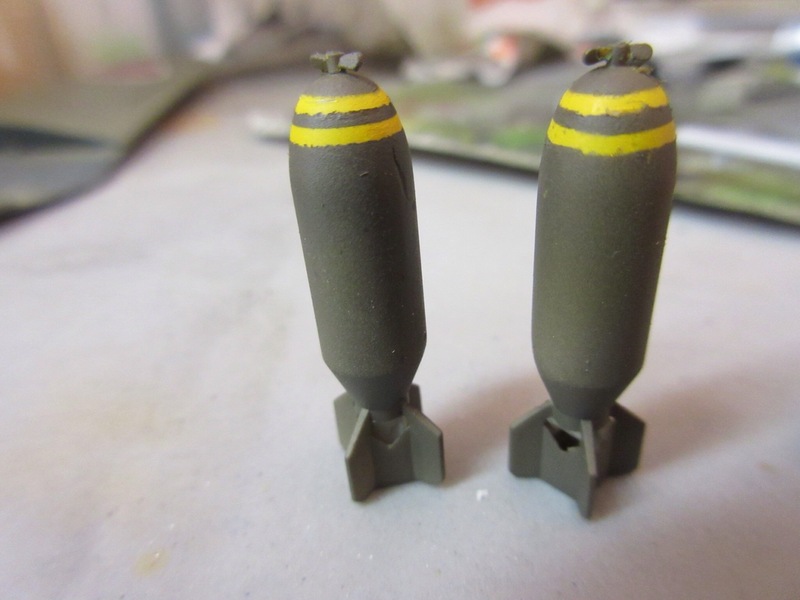 Both decals appear to work well with decal solvent. I’m glad this has gone better. Everything about this kit has been great so far; the fit, engineering, and instructions. 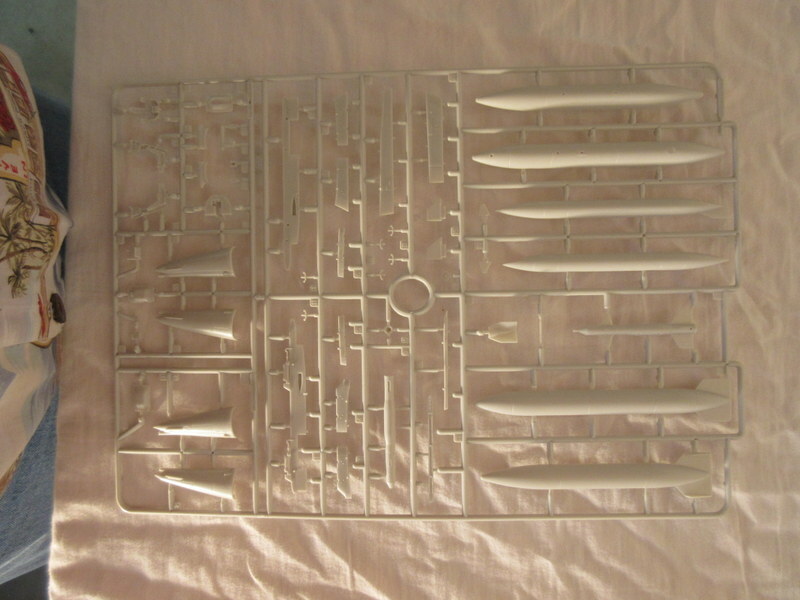 I have a number of complicated decals to go so here’s hoping for the best. Was good to get a few minutes in the garage today. It’s been such a nice sunny day and being its Valentines Day and all it was good going out with the lovely bride most of the day. After cooking a great meal it was time to spend some Saturday night time on the bench. I decided to add some darker aluminium to a few panels. When I started out my first thought was to do a dozen or so but after I got started I sort of went “Meh” and only did a few. I really want to get this one moving along to meet my 2 a month goal this year. 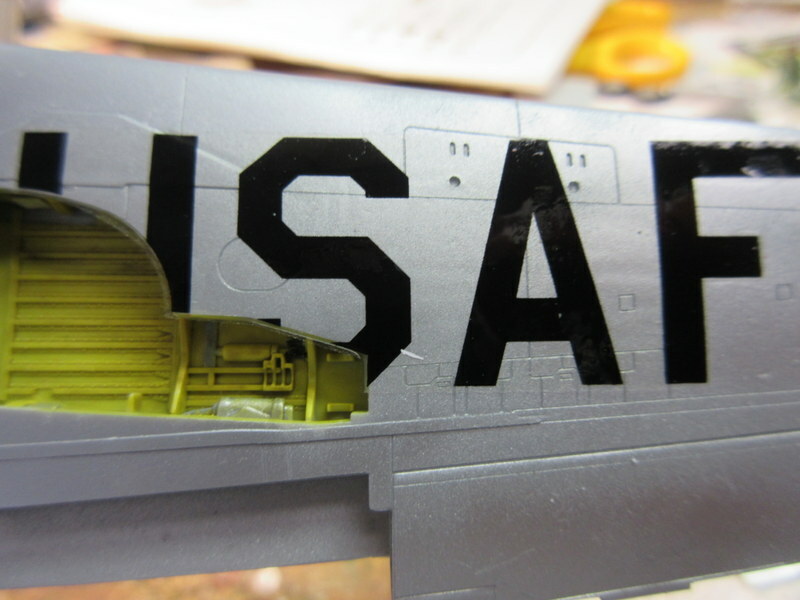 I also decided to tackle the olive drab anti-glare panel tonight. 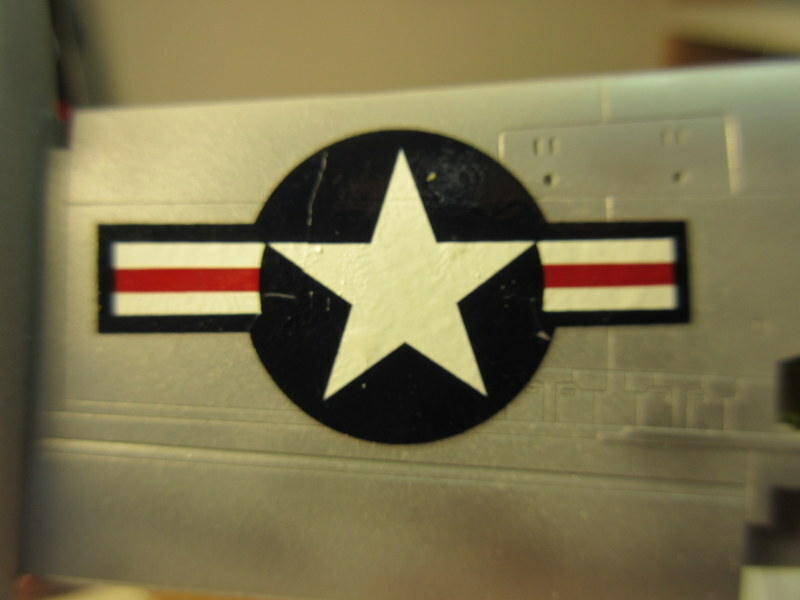 The kit comes with decals for this but they are too shiny. This needs to be flat. 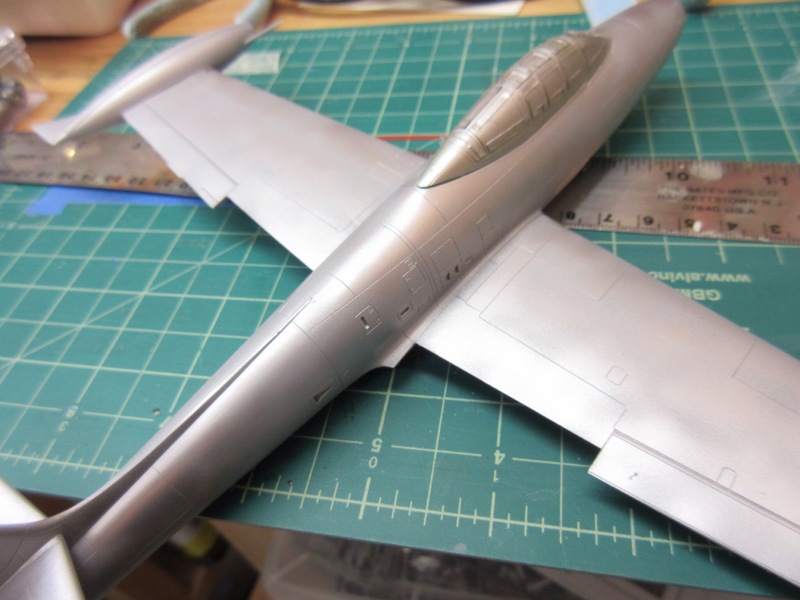 Next is decaling. 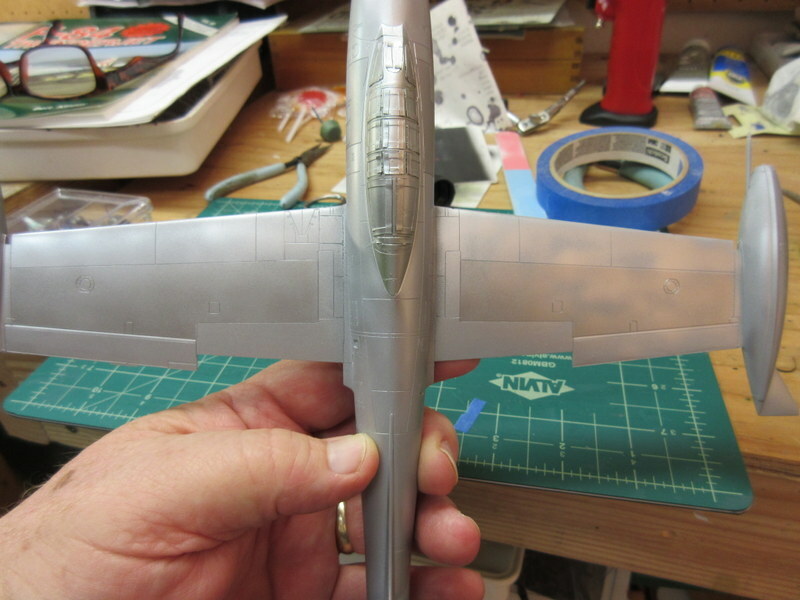 I’m going to be interested in how complex it will be to place the rudder markings and get them to settle down and look painted. Time will tell. 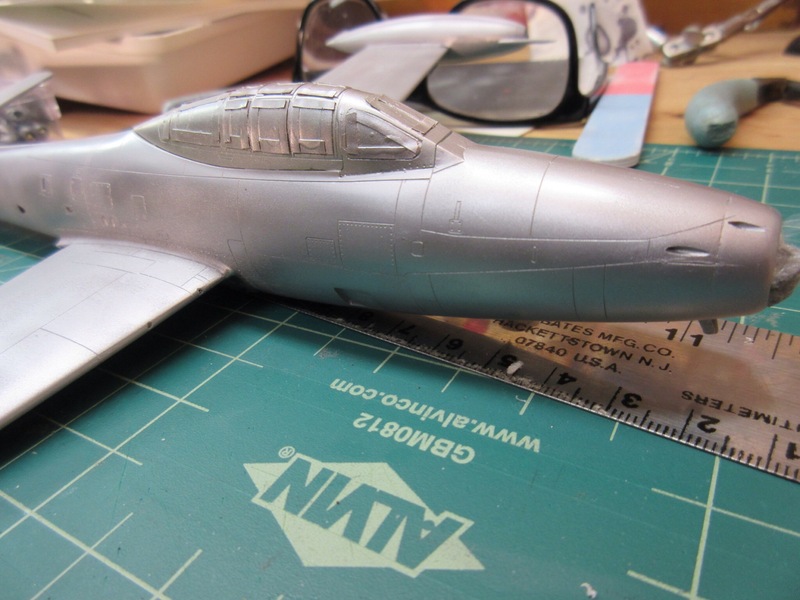 Been a bit slow in cranking out the plastic over the last few days. It was birthday weekend and I’ve been involved with the family. 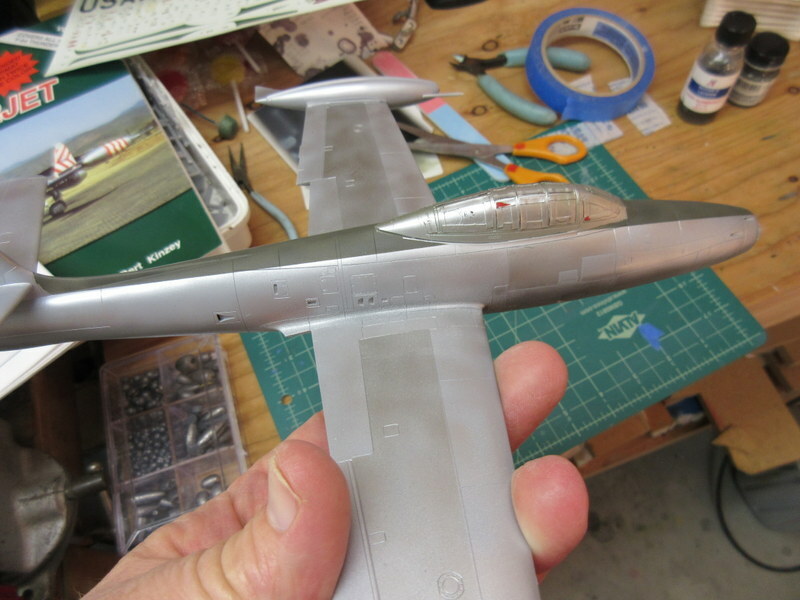 I did get the F-84 painted with Alclad grey primer and Alclad aluminum. As you can see in these shots it doesn’t have that real shiny appearance but I don’t think that looks real. 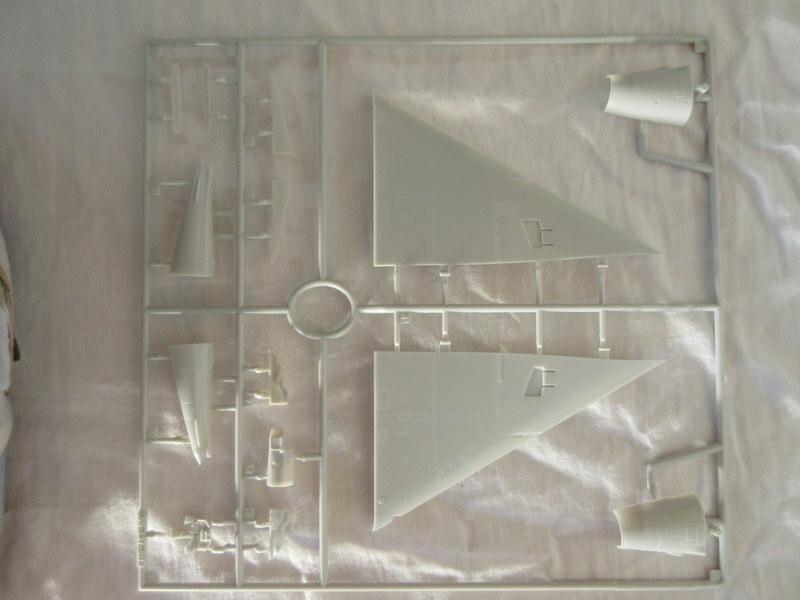 By varying the level of primer I use it seems to create a little bit of patchwork silver on the kit, which will take well to weathering later.